Haghtanak Zbosaygi (Victory Park) is a big park located at the top of Cascade in Yerevan. The park is named Victory Park in commemoration of Soviet Armenia's participation in the second World War. The park is a large forested area with an artificial lake, an amusement park, cafes, the Mayr Hayastan statue and museum, and sweeping views of central Yerevan. The current statue replaces a monumental statue of Joseph Stalin that was created as a victory memorial for the Great Patriotic War. During Stalins reign of the Soviet Union, Grigor Harutyunyan, the first secretary of the Armenian Communist Partys Central Committee and members of the government oversaw the construction of the monument which was completed and unveiled to the people on November 29, 1950. The statue was considered a masterpiece of the sculptor Sergey Merkurov. The pedestal was designed by the architect Raphael Israelian. Realizing that occupying a pedestal can be a short-term honor, Israelyan designed the pedestal to resemble an Armenian church - at least on the inside. In contrast to the right-angled shapes of the outside, inside was light and pleasing to the eye and resembled Ejmiatsins seventh-century St. Hripsimeh Church. In 1967 the statue of Stalin was removed (with two workers being killed during the process) and replaced by the Mother Armenia statue, designed by Ara Harutyunyan. Mother Armenia is the female personification of Armenia. 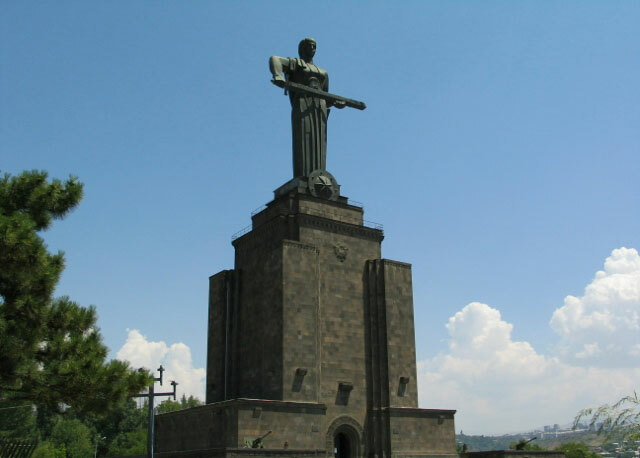 Her most visual rendering is a monumental statue in Victory Park overlooking the capital city of Yerevan, Armenia. The Mother Armenia statue symbolises peace through strength. It can remind viewers of some of the prominent female figures in Armenian history, such as Soseh Mayrik and others, who took up arms to help their husbands in their clashes with Turkish troops and Kurdish irregulars. It also recalls the important status and value attributed to the older female members of an Armenian family. 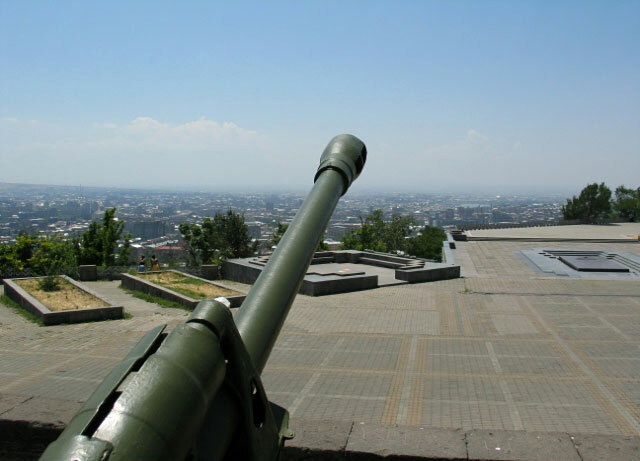 Its strategic location of being on a hill overlooking Yerevan makes it look like she is the guardian of the Armenian capital. Each May 9, thousands walk past the statue of Mother Armenia to commemorate Armenias war dead.